Cyflect Glow in the Dark Reflective Honeycomb Tape is visible through smoke, fog and any angle. 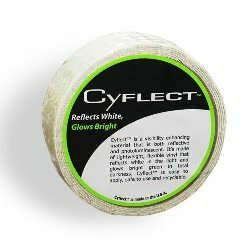 Cyflect reflective and glow-in-the-dark safety tape will lead the way when the lights glow. Ideal for egress points, stairs, doorways and exit routes, CyFlect® the only product where 100 percent is designed to both reflect white light and glow bright.